What do you do when your own body weight becomes easy to lift and run with? You add more to it, of course! Weight vests are the best way to add additional pounds to your body. Unfortunately, many people experience problems when buying one. That is why we put together this guide to buying the best weight vest for training strength, endurance, agility, and power. Running With A Vest: Yes Or No? Weight Vest or Weight Belt – Which Is Better? So you’ve decided you need a weight vest. If you are serious about fitness, getting one is a great investment. A WORD OF CAUTION: Before we get into the details, it is worth mentioning that weighted vests are not a training tool for beginners. Your form and movement in any activity should be perfect before you consider adding weight, or you risk injuring yourself. The first questions people ask before buying a weight vest are: what kind should I get and how heavy should it be? There are many kinds out there, but the major difference you want to look for is fit. You don’t want it to be loose and flail around, or worse, too tight to cut off circulation. As for the weight, it depends on your own weight and the activity you plan to use it for. For women, 10 lbs might be all you need if you go running. If your goal is the strength, a heavier vest with additional space will be a better investment. 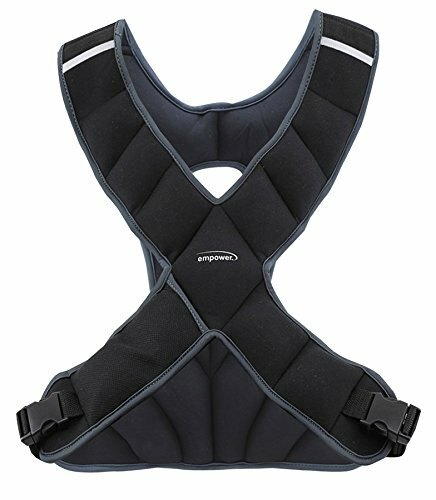 In general, the best weight vest for running and all sports should be in the range of 5-10 percent of body weight and should be worn for no more than half of your sessions (Source). If you are going to use it to add weight to your body weight exercises, the best weight vest for pull ups, push ups and dips will be the heaviest one you can get, so that it will last you a long time. Some vests come without shoulder padding, which can make wearing it for longer periods uncomfortable. A padded vest will cost more, but if you want to go low budget, you can also get a padded shirt to wear under the vest, or just improvise the pads with some foam. Also, consider the length of use: will you wear it for a long time, or only for your sets (and take it off in between)? The longer you’ll have it on, the more you will need the added padding. The great debate around weighted vests is whether or not they are good for running. Wearing them during running does increase the metabolic cost, which means you will burn more calories than without it. However, that may come at a cost to your knees. 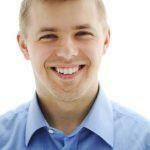 Studies have shown that added load changes the way we walk and run, and not for the better. The takeaway is: be careful to add the load slowly and if you have previous injuries or issues, stick to low impact activities, such as incline walking. If you are not in the army or in a similar job which requires you to be prepared for weighted carries, stick with lighter weights if you still want to go running with it. This is a legitimate question. A weight belt seems every bit as comfortable to use at a much lower price. Why should you shell out for a vest when you might not need it? Mainly, the vest comes with two advantages: it doesn’t move around and it can be used when you are inverted. If you want additional weight for running, climbing, Crossfit or any sport, the weight vest is the only way to go. For all those activities, the weight must be fixed to you securely and a belt doesn’t allow that. Also, if you want to add weight to your handstands or handstand push-ups, it is a necessity. It is also a much more practical way to add weight to regular push-ups. Otherwise, if you just need a way to add weight to your dips or pull-ups, a weight belt might be more convenient. The Cross101 weight vest is praised for its snug fit and adaptability. Due to it, this one can be used both by small women and larger men. The waist strap is very adaptable and can fit most people. The dimensions are 14’’ in height and 12’’ in width. The weights are evenly distributed front to back and can be added in 2.5 lbs increments. If it starts to smell due to sweat, you can put it in a washing machine without damaging it. 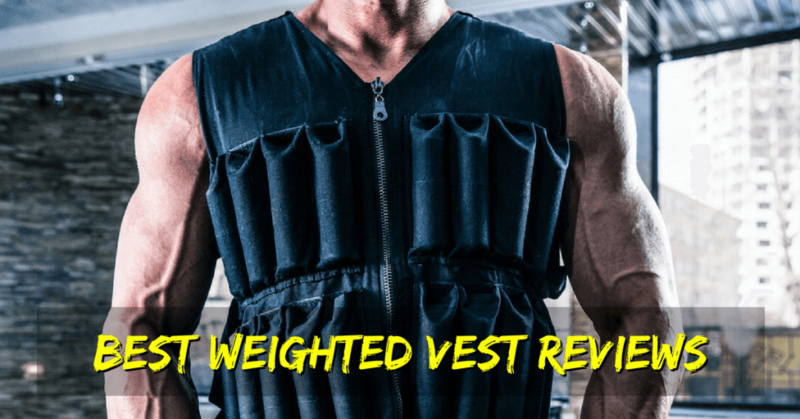 If you are looking for a cheap weight vest, this one has a great price-to-value ratio. A great choice if you want a vest for running, Crossfit or other sports. The only problem people complain about is the lack of shoulder padding, but it can quickly be remedied by using a padded shirt. This might be a necessity, especially if you have a larger frame and the fit becomes too tight. If you are looking for a premium weight vest, this might be the one for you. Made from high-quality materials, it is one of the most robust vests on the market. It comes with 50 lbs of weight, which is added in 3-pound increments. 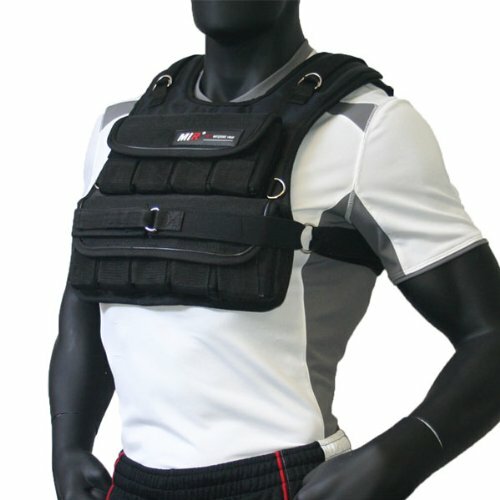 The total capacity of the vest is 60 lbs, which makes it ideal for strength training. Despite the weight, it is comfortable due to the double padding. It is also completely adjustable, both in the waist and the shoulders. The short and compact design allows for maximum mobility, which you need when doing bodyweight exercises. Despite its excellence, we would not recommend using this one to women, as the design might cause uncomfortable (instead, take a look at one made specifically for women). If you are a woman, a vest designed specifically for you might be a good option. 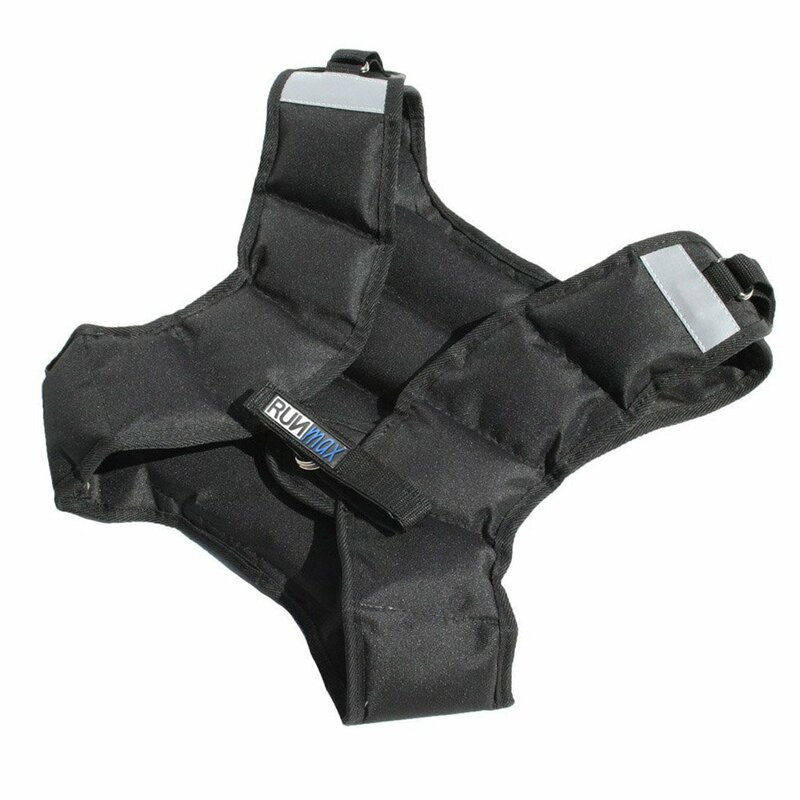 The Empower weighted vest is one such. Its unique X-shape is designed to fit women. It is also quite adaptable due to the stretchy neoprene fabric. It comes in two versions: 8 and 4 lbs. Due to the lightweight, this is a great choice for beginners and women. It’s not going to offer too much resistance for lighter people who might find other vests too heavy. The lightweight means that it comes at a low price point. However, that does not mean that the quality has been compromised: the vest is sturdy and comfortable during use. The only problem people experience is the shoulder straps coming loose after some time, but they can easily be fastened by hand. The RUNFast weight vest comes in many weight variations. From the 12 lbs, which is great for running, Crossfit or just to make your old workout extra hard, to the 60 lbs, the use of which will add serious muscle and strength to your body. The light version (12 lbs) is not a full body vest, which means it will fit women better. The rest are and due to its full length, they may impair you during some exercises, like the sit up, if your torso is shorter. The waist straps don’t carry any weight, which means that it all goes on the shoulders. The weight can be adjusted in 5-pound increments, which can be a big jump on some exercises. Otherwise, the build quality is great and the straps should stay strong for a long time. Still, if you plan to use it for longer distances, it can be uncomfortable without a padded shirt. 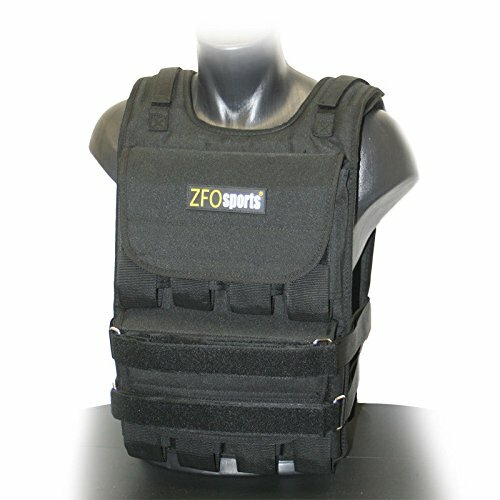 This ZFOsports weighted vest is designed to fit everybody. The fit is snug (double waist straps!) without compromising the breathing. The fit is tight even for smaller people, which can be an issue when buying a weight vest. The weights are removable in 2.5 lbs increments, which is what you want for slow, steady progress. It is a bit cheaper than the top-of-the-line vests, which makes it a great value purchase. Of course, the quality is still great and with proper care, it should last for years. The only thing people complain about is the lack of an instructional manual, but just go and check out one of the many videos on YouTube with assembly help. 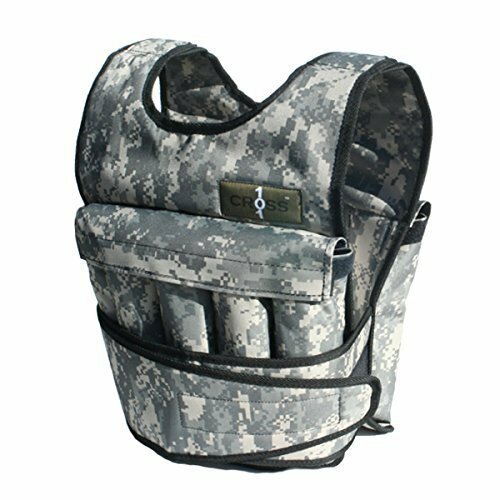 …MIR 50LBS Short Adjustable Weighted Vest! MIR products are simply of great quality and when buying one, you know it’s going to last you a lifetime. Why spend half the money on a vest that will break in a year? Pay nice or pay twice: the MIR is worth the price tag. The fit is snug while allowing for all the mobility you need. The 3 pound increments are small enough to be useful for steady progress. The padding is comfortable for long bouts of exercise. If you have the money, this is a no-brainer. For women who only want a light weighted vest, the Empower is also a good choice. For a budget weight vest, go with the Cross 101. That is it! We hope you will enjoy your new weight vest and that you will progress in your training because of it.